If you want to learn How can we do CRUD(Create, Read, Update, Delete) operation with upload file in new version of Laravel 5.8. So, from this post, you can find step by step process of doing CRUD with Mysql database from Laravel 5.8 application. For do CRUD in Laravel 5.8, first you have to upgrade your Laravel framework. For upgrade Laravel you have to go to this Laravel Upgrade Link. Contributors of Laravel has continue improvement in Laravel every version. So, in Laravel 5.8 version you can find something new as from Laravel 5.7. There are following new feature introduced in Laravel 5.8.
convention-based automatic registration of authorization policies. DynamoDB cache and session drivers. Support for assigning multiple authentication guards to broadcast channels. PSR-16 cache driver compliance, improvements to the artisan serve command. Pheanstalk 4.0 support, and a variety of other bug fixes and usability improvements. If you want to get detailed information on Laravel 5.8, then you have go to this Laravel 5.8 relase Link. If you want to use Laravel 5.8 for your web development, first you have to check what is minimum server requirement for using Laravel 5.8. Below you can find Laravel 5.8 server requirement. Suppose you have check all above server requirement, and you have all above requirement, then you can start using Laravel 5.8 framework version. 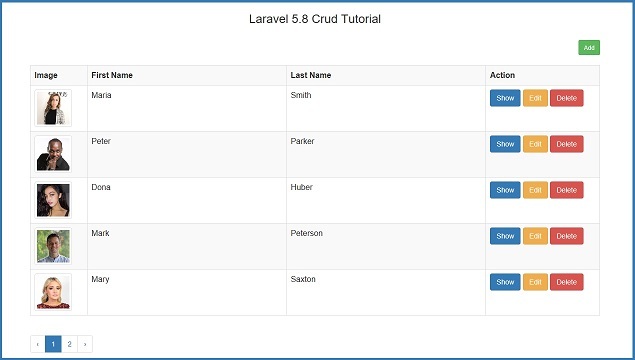 So, here first we will make simple CRUD Application in Laravel 5.8, for this you have to following steps. In first step you have to download Laravel 5.8 version. For this you have to go to command prompt, in which first you have go to your folder path in which you want to download Laravel 5.8. After this you have to run "composer" command, because all Laravel depository handle by composer. After run "composer" command. You have to run following command. Above command will make crud folder and under this folder it will download Laravel 5.8. Once you have download Laravel 5.8, so now first we want to make Mysql database connection from Laravel 5.8. You can make Mysql database connection from two way. In first way you have to find .env file in your Laravel 5.8 folder. Open that file and under you have to define your mysql database configuration like below. In second way, you have to open config/database.php file, and under this file you can also define your mysql database configuration. After defining above details you can make Mysql database connection from your Laravel 5.8 application. In Laravel framework, you have facility from make table in Mysql database from your Laravel application. For this first you have to create migration file in your Laravel folder. For this you have to write following command in your command prompt. This command will create migration file in database/migrations folder. In this file we have to define table column which we want to create in table. Below you can find migration file in which we have define table column. Now we want to migrate this table definition from this Laravel application to mysql database. For this we have write following command in command prompt. This command will make crud table in mysql database for perform CRUD operation from Laravel 5.8 application. In this we will seen how can we make model file in Laravel 5.8. This class file mainly used for do database related operation in controller class. For create model files we have to write following command in command prompt. This command will make Crud.php model file in app folder. In this file we have to define table column name which you can see below source code of Crud.php file. Controllers files mainly used for handle http request in Laravel 5.8 application. Here we want to create Laravel 5.8 crud controller. For this we have to go to command prompt and under this we have write following command. This command will make CrudsController.php file in app/Http/Controllers folder. Once you have open this file, then you can find all predefine method for do CRUD operation in this controller file. We have to just add code for do particular operation. Below you can find CRUD controller file code below. index() - In Laravel Crud controller index() method is a root method of crud controller, so when in browser we have enter base url with controller name, then it will called this index() method. Under this method we will write code for display data from mysql database. In this code it will first fetch data from crud table and store under $data variable, after this we want to make paginate link by using paginate() method in Laravel 5.8. For send data to view file, for this we have use view() method for send data to view file. Source code you can find under index() method. create() - This method has been used for load create.blade.php file. In this file user can find form for insert new records and filling data insert data request will be send to store() method of CrudsController.php controller class. store() - This method has received add or insert new records request received from create() method. In this method, it will perform two operation. One is for upload image file by using move() method and second is for insert records into mysql table by using model class. Before upload of image, it will rename image name. After successfully insert or add of data in mysql table from this Laravel 5.8 application, page will redirect to index() method with success message. show() - This method in Crud controller has been used for fetch single data details based on on value of $id argument. For this it has been used findOrFail() method. After fetch details it will send to view.blade.php file. edit() - This method main function is fetch single data from Mysql database and load into edit or update form for make required changes. update() - Update method has received edit or update data request from edit(). This method has done two function like upload of profile image with update or edit mysql data in Laravel 5.8 framework. delete() - Delete() method mainly used for remove single or multiple data from Mysql Database. This is last operation Crud Operation in Laravel 5.8 Crud tutorial series. This is very useful step in Laravel 5.8, because here we want to set route of all CrudsController class method. For this we have to open to routes/web.php file. In this file we have to write following code for set route of all method. This is the last step in Laravel 5.8 Crud application, and in this step we have to set data in view file which has been store under resources/views folder, because this view file has received data from controller method, so here we have to set data in view file. Below you can file all view file which has been used in Crud application, and you can also find how data has been set and how to make form in Laravel 5.8 view file. Lastly, we want to run Laravel 5.8 Crud application, for this we have to go to command prompt, and write following command. Above command will start Laravel 5.8 application. For run Larave 5.8 crud file, you have to write this url http://127.0.0.1:8000/crud in your browser for test code is working or not. Here will make simple CRUD application with uploading file in Laravel 5.8 version.